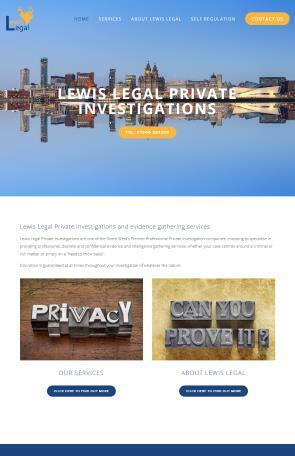 Lewis Legal Private Investigations and Detective Agency is a highly Professional Private Investigations and Detective Agency specialising in Miscarriages of Justice, and Public Body Corruption and Collusion Investigations. We also offer evidence gathering for both Civil and Criminal Legal Process, Domestic Investigations, and Legal Process Service anywhere in the UK. We provide private investigation and detective services to solicitors, industry and individuals. Lewis Legal is a specialist investigations bureau servicing the legal fraternity, the commercial sector, and members of the public who are looking for evidence to begin a legal process or defend themselves against such a process. Investigating suspected acts of adultery or cohabitation. Due diligence procedures are undertaken on all cases to ensure appropriate processes and checks are put in place. North West based Lewis Legal operates across North Wales and North West England, including Wrexham, Chester, Merseyside, The Wirral, Liverpool, Greater Manchester and Lancashire. When appropriate we have the operational capability to progress an investigation throughout the UK and overseas.